DiskTuna is an easy to use, on-demand, no frills disk optimizer and defragmentation utility for FAT, FAT32 and NTFS formatted drives. Through a simple to use mechanism you can create ‘jobs’ that enable you to schedule or launch disk optimization with just one click. DiskTuna is freeware. DiskTuna reorganizes your disk and will make it faster and more responsive. DiskTuna is safe: It relies on the proven and reliable Windows defrag API to move files. 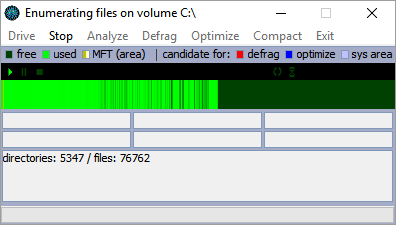 It checks the volume state prior to defragmentation. DiskTuna features a VSS safe-mode to reduce interaction between defragmentation and shadow copies and a thermal monitor to protect your hard disk from overheating. DiskTuna is capable of moving and defragmenting the MFT online. DiskTuna can optimize Windows boot speed by placing bootfiles, folders and frequently used files in the fastest portion of the harddisk (outer tracks). Defragmenting or optimizing your hard disk doesn’t have to be complicated! Just select the drive you wish to defragment or optimize and click ‘Select Drive’. Check the ‘VSS safe-mode’ option if you are using shadow copies in Windows Vista or higher. You can now immediately defragment, optimize or compact your disk. Optimize is the most complete operation: It will optimize file placement for booting and general usage, compact files (fill free space gaps) and defragment your hard disk. Optimizing should only be required every one or two months. Note the disk temperature that is displayed! DiskTune monitors the temperature of the host disk the selected volume resides on using SMART. In the drive selection window, click ‘more’ to create ‘jobs’. A job is a defragmentation or optimization task. When created, a shortcut to the job is placed on your desktop automatically. In addition you can specify what DiskTuna needs to do when a task has finished. After a quick defrag you may want it to close automatically. As optimizing a drive may take a while you may want to start after you have finished your work and you leave it to DiskTuna to shut down your PC when it is done. There are 3 ways of putting DiskTuna to work; start a task from the interface, start a task by clicking the context menu of a drive or folder, or double-click a desktop job shortcut. Shortcuts are also perfect for automating defragmentation or optimization tasks using the Windows Scheduler.